Selective demolition (or “deconstruction”) encompasses the removal of all existing building materials that you intend to replace or that block access to other components of the project. If you are altering the building’s structure, it will be necessary to construct temporary supports to prevent damage to the remaining structure. Consult a professional if you are unsure of which elements are structural and which may be safely removed. Selective demolition drawings may be required as part of the construction documents you present when you get your permit. Before demolition starts, you or your contractor will need to contract with a private “roll-off” dumpster service – most dumpster services rent their dumpsters at a specific weekly rate and add either a collection fee or a “per ton” fee for dumping. Purchase a tarp to cover the dumpster and prevent rainwater from soaking the materials, which will add significant weight. Hazardous materials – It is important to have the building assessed for environmentally hazardous materials such as lead paint and asbestos. If these materials are found you may either have them professionally removed or “encapsulated”. Structural walls and beams – Your preliminary assessment and/or permit drawings should indicate which walls are load bearing. Do not attempt to remove walls or cut beams without professional advice or assistance. Be particularly careful working with any wall that runs perpendicular to the joists above. Decks and porches – If you are removing a wood deck or porch, be very careful to prevent a collapse. Avoid standing on or under any destabilized structure as you are working. Damaged floors and joists – Pay particular attention to the floor structure (subfloor and joists). Water and fire can compromise the floor’s structural integrity, adding to the danger for an inexperienced worker. Roof – The higher you are off the ground, the greater likelihood a fall will cause serious harm. Sloped roofs can be dangerous if shingles are in poor condition (slate roofs are even higher risk of failed connections and slippery situations). Leave the high-wire acts to the professionals. The following demo activities fall within the skill range of most people. Carpet – Most carpet is attached to the floor beneath with a “tack strip” around the edges. Start at one corner and pry the edge of the carpet up from the tack strip. Once one corner is released, the rest should come up with a strong tug. Use a thin pry bar to remove the tack strips after the carpet is pulled. Use needle-nosed or “nail-biter” type pliers to remove any staples and carpet tacks. Trim, casing, and moldings – Use a thin pry-bar as a lever against the wall – try to pry where nails are located to minimize cracks and splits in the wood. Attempt to work slowly and evenly across the length of the piece rather than prying one side completely out before the other. Using pliers, pull nails out through the back of the wood. Store architectural woodwork in a dry, safe location during demolition and construction. Plaster – Plaster is held to the walls and ceilings on thin pieces of wood called lath. 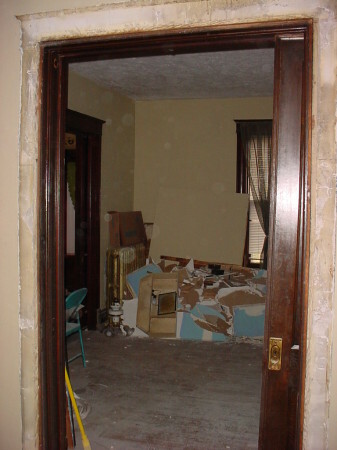 It is relatively difficult to remove small sections of plaster/lath without damaging the surrounding area. Large areas, however can be removed quickly using a few simple tools including a hammer, medium or large crowbar, and sledgehammer. Be careful of exposed nails in the lath that comes off the wall and always wear appropriate gloves, well-fit breathing masks or respirator, long sleeves, and long pants. Some plaster may contain asbestos fibers and paint may contain lead. If you suspect any hazardous materials, hire a licensed contractor to assess and remove them. Cabinets and fixtures – Permanent “furniture” such as kitchen cabinets can usually be easily removed using a cordless screwdriver and pry bar. Most fixtures such as toilets, sinks, and tubs can also be removed easily after shutting off the water supply. Cast iron tubs that are in unsalvageable condition can be broken up using a sledgehammer and removed in pieces (wear safety glasses and protective clothing to prevent injury from flying shards) – this is a good way to release some of your pent-up frustration over financing, permitting, and design. Performing some of the demolition yourself can help ensure that items you want saved are protected appropriately. Participating in the selective demolition process can help give you a better understanding of historic construction practices. If you hire a demolition contractor, be very specific about the architectural features you want protected (windows, railings, trim, fixtures, doors, fireplace surrounds, etc.) and the walls to remain. You may want to build temporary protection out of plywood around large items to remain, such as a carved railing or a built-in stone fireplace surround. Some building materials and fixtures in good condition are accepted by local salvage shops for resale. Take care to remove any salvageable items. the Iowa Department of Natural Resources has a webpage dedicated to construction debris recycling information – be conscious of reducing the strain of building and renovation on our shared landfill resources.